Eating our way through the south-eastern corner of Sicily was high on our agenda when we touched down after a very long flight from Melbourne. Catania was our overnight pit stop to normalise somewhat before hiring a car and heading down to Siracusa, to our lovely four day stay (I know, not long enough you say). We always knew that Sicily would require many more visits to absorb and understand its beat, but needed to be mindful of the fact that there were other regions of Italy we needed to fit into our whirlwind family holiday. It was recommended that we station ourselves in one spot to then take some day trips to surrounding areas; Palazzolo Acreide being the one definite destination as this is where my husband’s father is from. It is also where his last living aunt still resides in one of the town’s oldest palazzo and we were very excited to meet la zia Carmela. Siracusa and the island of Ortigia also came highly recommended by friends; and the rest, well we left it to the Sicilian Gods to decide. That they did. What we hadn’t planned for was the amount of time given to us by my husband’s cousin Anna Maria and her husband Salvatore, (who happens to be a commissario - police inspector). They not only led us from town to town, but also provided a history and culinary private tour. I must say, travelling around Sicily with a commissario felt a little special and a bit like an episode of Montalbano even though we weren't in Punta Secca. We followed them around Siracusa and Ortigia, spent some time in Palazzolo Acreide; meandered through the beautiful countryside leading to Modica and on the last day making our own way to Noto before driving back to Catania to fly out to Naples. It was a full four days, heads and hearts filled with stories and stomachs too; returning late each night to our charming B&B, where our hosts eagerly awaited to hear about our adventures the following mornings. 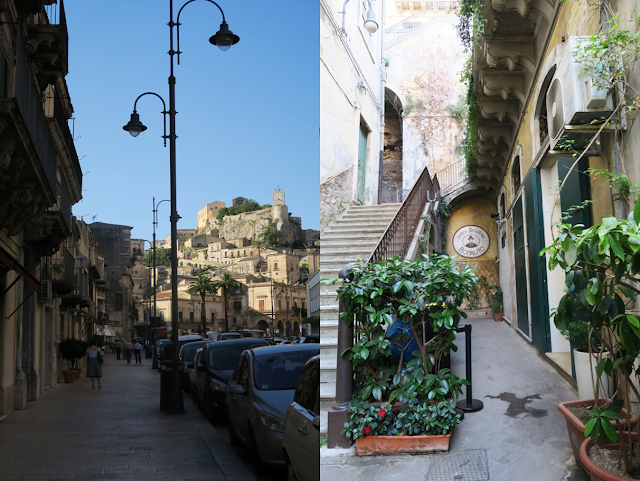 To give justice to the places we visited and photos taken; this post will focus only on Modica, including a recipe for its renowned scaccia ragusana. There will be subsequent posts on other parts of Sicily to follow in due course. Other than wanting to visit this city’s renowned chocolate factory I had heard so much about, I left the food suggestions to our hosts who knew where to find some of the best scacce. The early afternoon began with a chocolate fix, and eating the most amazing cannoli siciliani that I have ever tasted at Antica Dolceria Bonajuto. Here we sampled all sorts of chocolates as well as liqueurs and if organized in advance one can also book in a tour of the factory that has been around since 1880 and learn more about these six generations of artisan confectioners. Scacce, although found in various areas of Sicily, they originate from the south-eastern side of the island and are typical of this pretty town. Scaccia ragusana is delicious paper thin yeast-less dough slathered with tomato and their local cheese. The dough is folded several times with a new coating of sauce and cheese each time. The end result once baked is a rustic looking roulade with a crispy exterior and a soft, saucy inside. It puffs up while it is baking and then deflates once you cut into it. The aromatics responsible for the sauce’s intense flavour are the fresh basil and garlic. We sampled a variety of freshly baked scacce in Modica at L’Arte della Focaccia Rosticceria. Definitely their specialty with many to choose from - ones filled with meat, some with broccoli and others with spinach and cheese or tomato and cheese. My favourite from this city were the scaccie ragusane and based on what I tasted and some questions asked, I can confidently say that this recipe is very close to the real deal and very easy to make. I recipe tested this scaccia after my friend Jessica wrote and told me about it along with her family’s recipe for another amazing variety made with eggplant and almonds I posted about here. I was super excited to sample it in Modica as well as in Palazzolo Acreide. The dough can be made in a stand mixer with dough hook, or alternatively combine flours in a large bowl and make a well in the centre. Add salt and 2 tablespoons of the oil and rub flour and oil together with your fingers until mixture resembles coarse peas. Start adding water, about 2 tbsp at first, and knead into soft dough. Keep adding water and kneading until the dough is soft, smooth and no longer sticky. Cover the dough with a kitchen towel and let rest at room temperature for 30 min. Heat the remaining 2 tablespoons of oil in a saucepan. Add the crushed garlic and cook for 1 minute; then add the tomatoes, season with salt and cook until thickened and reduced for about 10 minutes. Add the basil and set the sauce aside to cool. On a large work surface, dust with flour to prevent the dough from sticking, and roll the dough into a large thin rectangle. Spread a thin layer of sauce on the dough and sprinkle with cheese. Fold left and right sides of the dough to meet in the middle, and top with more sauce and cheese. Bake for 10 minutes at the highest setting – 250 C /482 F. Reduce oven to 180 C /356 F and bake until the dough is set and lightly charred, about 50 minutes. Cool before slicing and serving.